Village Lodge is built in the style of a traditional Bhutanese house and set in fertile farmland in the Paro Valley. Accommodation is simple but comfortable, with high ceilings, wooden floors and large windows. The rural location makes for a tranquil atmosphere. Open: Village Lodge is open all year. Location: Village Lodge is located in a rural surrounded by farmland in the Paro valley. The lodge is just a few minutes' drive from Paro airport and the town centre. Rooms: There are 9 rooms decorated in Bhutanese style and with en-suite bathrooms with underfloor heating. The lodge offers room service. 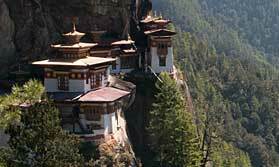 Activities: Visiting Tiger's Nest Monastery, trips to local monasteries, dzongs and temples, exploring Paro town's shops. Facilities: The restaurant serves local and international dishes which can be enjoyed indoors or in the open air on the large terrace. There is a well-stocked bar with local and imported drinks. The lodge has a spacious lounge. The spa features a hot stone bath. The lodge has a small library and a business centre. The reception is open from 6am to 10pm each day. Village Lodge has a laundry service and a currency exchange. Dining: Meals are taken at individual tables in the restaurant. Health: We recommend malarial prophylactics for travel to the low lying districts of southern Bhutan. We know and love Bhutan, and would be delighted to help you plan your perfect trip here. Let us help you plan your perfect tailor-made holiday to Bhutan. Talk to one of our travel experts. Tell us what you want, and we will tailor make your perfect trip. Bhutan 8 night culture and adventure holiday.